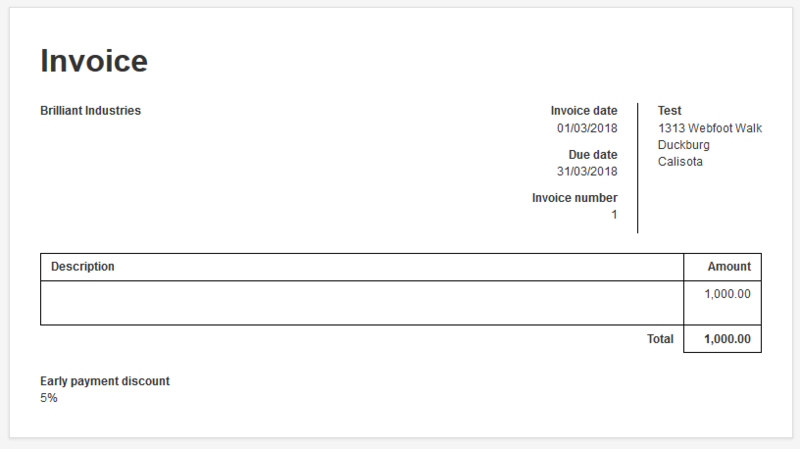 The latest version (18.3.8) allows to set early payment discount on invoices. The feature is rough around the edges so it will be improved based on the feedback but feel free to test the concept. 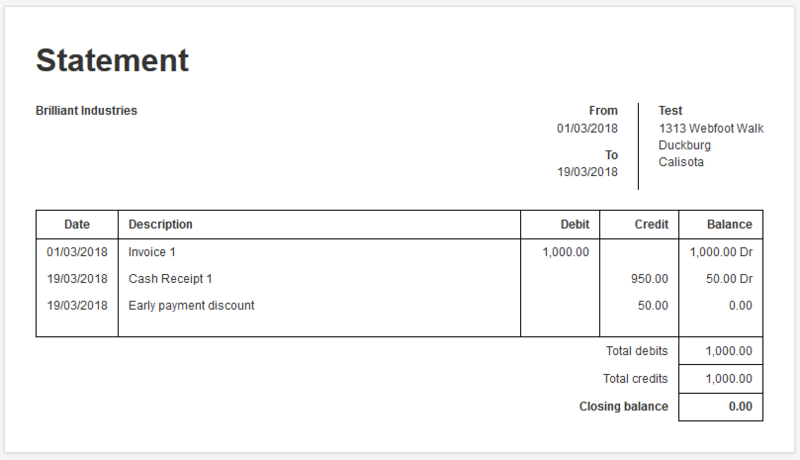 Early payment discount kicks in when invoice is paid before due date but it could be further improved to allow early payment discount to be applicable only if invoice is paid within a few days (e.g. 7 days) from invoice issue date rather than waiting for a day before due date (e.g. 30 days later). When early payment discount is activated, for now the invoice will show notice as a note. This could be also improved by showing the exact amount how much is payable if paid early. In this specific example, let’s assume we have an invoice for $1,000 with early payment discount of 5%. If customer pays $950 or more before due date, they will be eligible for early payment discount. If one or more invoices are eligible for early payment discount, you will see notice at the top of the screen under Sales Invoices tab. Clicking on the notice will show list of invoices (in this case just one) which are eligible for early payment discount. When you click Create button, early payment discount transaction(s) will be created for those invoices. The invoice will be marked as paid after early payment discount transaction is created and when viewing the ledger or customer statement, it will be shown appropriately. Those who are familiar with late payment fees concept in Manager might wonder why not apply discounts automatically if specific conditions are met. After all, late payment fees are automatically applied. I’m leaning towards recognizing the way late payment fees are implemented was a mistake. It shouldn’t have been automated and Manager should have created manual entries which can be reviewed, adjusted or forgiven. I will see how implementation of early payment discounts goes and will probably make late payment fees to work the same way. this would be beneficial to many. i am unable to test this feature at present. so can you please explain whether early payment discounts are applied to the total invoice value or the tax exclusive total? your example above does not show any tax invoice. also, the statement does not seem to show invoice number to which the early payment discount was credited. the reason i am asking is because we would want it on the tax exclusive total. an invoice generated on 20th of previous month would have a due date as 20th of the current month. in this case the business is liable to pay the tax during the monthly returns filing. if the early discount is applied to the invoice total it would be a loss because the business would have already paid the tax amount and then offering a discount too. can you please explain whether early payment discounts are applied to the total invoice value or the tax exclusive total? Early payment discounts will be always applied on tax-inclusive totals. They have to be. If customer pays early and receives early payment discount, it will debit your tax liability appropriately so you don’t pay taxes on amounts which you have never earned. this is exactly what i was afraid of. the tax amount is already paid to the tax authorities irrespective of whether the payment has been received or not. we cannot reverse the tax paid to the authorities because of a discount given to the customer. issuing a credit note is possible only when there is return of goods in which case the applicable tax can be reversed. so adjusting the tax liability in Manager for a discount given will not be the best approach. issuing a credit note is possible only when there is return of goods in which case the applicable tax can be reversed. Frankly, I find this a bit unbelievable. Early payment discount is not a valid reason to reverse tax? Early payment discount is not a valid reason to reverse tax? reversal of goods and service tax is possible when there is goods or services involved. discount cannot be considered as goods or a service. Even if that is the case (and I doubt it is), early payment discount has to be applied on tax-inclusive amount. If you can’t get tax credit, then you might need to offer a bit lower discount to account for that (you will not get tax refund) and Manager will need to have an option not to reverse tax if discount is given (as to reflect the reality). i believe there will be a lot of different opinion regarding this topic. in India we file the monthly returns with all the invoice details uploaded to the govt. so i do not think there should be a discount applied to the already issued invoice. rather the discount should be added as a line automatically when issuing the next invoice to the customer. so this discount will be available as a credit to the customer for future sales. To my knowledge early payment shouldn’t affect tax liability. There are two types of discounts. Trade discount is clearly shown on invoices together with the tax liability as Manager is correctly doing. Cash discount is an offer to the customer to pay cash quickly and must not affect the tax liability, why because it hasn’t changed the invoice/Bill. If it shown on the invoice/bill it usually an offer. it an offer to receive cash earlier than expected. Cash discount is a company decision and should be a company loss, the state shouldn’t lose tax because the customer paid earlier. I have to do more research but this is what i know. your explanation is more or less similar to mine. a discount cannot be applied to an already issued invoice. it can be made applicable to the next purchase as an appreciation for early payment previously. this discount would be tax exclusive and will not affect the taxable value in an invoice. I agree with you @sharpdrivetek and my comment is aimed at supporting your argument. After @lubos implemented Withholding tax, I told him Withholding tax should be calculated on Tax exclusive amount but he wasn’t convinced but he introduced the second option of entering amounts for withholding tax. I didn’t add further comments because the second option also worked correctly for invoices that had lines that required different types of rate for withholding tax e,g 3% for goods, 7.5% for services in my country for example. But Withholding taxes should be computed on Tax exclusive amounts as well just like cash discounts. I looked up what Dutch VAT law says and I assume this applies to all EU countries. You send a customer an invoice for let’s say € 1000,- excluding 21% VAT which is € 1210,- including VAT. You have to pay the tax authorities the VAT which was included in the invoice being 210,-. He pays within one week and deducts 5% of € 1210,- which is a discount of € 60.50. In case this is too much of a hassle to create credit-notes, the discount is not € 50.- but € 60.50 in your P&L. nevertheless, this has to be done via credit notes with the invoice it applies to clearly mentioned and also the relevant tax applied on the invoice. it cannot be simply shown as a line on the customer statement. an example of the same is provided in the below link. How discounts will impact valuation of supply under GST. Which discounts will be allowed as deduction? Read to find out more. hope this clearly explains the requirement of Indian users regarding early payment discounts. @lubos, I have not thoroughly tested the new feature yet. But the possibilities of both discountable and non-discountable tax were covered in the Guide on early payment discounts: https://guides.manager.io/14497. There are certainly situations where both alternatives apply. So any feature in Manager must accommodate both. @sharpdrivetek, the link you provided includes three specific conditions necessary so tax can be reduced when an early payment discount is given. An offer of the discount on the tax invoice and furnishing a receipt showing the adjustment to the customer and specifying the invoice involved should satisfy these requirements, exactly as illustrated in the Guide linked to above. It is clear, though, that Indian users may encounter situations where both discounting alternatives are necessary. @lubos, I wonder if perhaps this feature needs to be rolled back until both discounting approaches can be incorporated. In the meantime, procedures in the current Guide cover all situations. the guide describes applying the discount on the receipt or voucher. but in our case we will have to issue a credit note. so the present workflow described in the guide will not be applicable to Indian users. there are two reasons i personally would not prefer early payment discounts applied to the total invoice value and rather just maintain it as a credit for the next billing. the invoice may contain different tax codes. the same tax codes have to be applied on the credit note too which would be a hassle. the customer in most cases would claim the full tax credit and may not reverse it, in which case the supplier would be at a loss. That is another way to handle the discount. However, it requires two transactions (credit note to reduce the account receivable and receipt to post the reduced amount) versus the single transaction outlined in the Guide. …the invoice may contain different tax codes. The Guide mentions how to handle different tax codes. the same tax codes have to be applied on the credit note too which would be a hassle. This is probably the main advantage of credit-note-and-receipt approach for Indian taxpayers. Your law requires that the customer reduce claimed input VAT by a proportionate amount to reflect the discount when one is given after the tax invoice is issued. With either approach, however, you cannot enforce the requirement on the customer. You can only provide the documentation. The customer still has to enter the tax reduction in its own accounting system. One major take-away from this topic so far is that Manager shouldn’t create Early payment discount transaction, it should just create a credit note under Credit Notes tab because ultimately that is what early payment discount actually is. If you plan to implement that, you still have to be sure the methodology allows for both discounting and not discounting tax. What is more user-friendly, requiring a number of boxes to be checked and discount amounts/percentages to be entered before such a credit note is created or generating a credit note based on possibly erroneous assumptions that must be edited away? Perhaps you unload some of that burden onto the task of creating the sales invoice, but it still seems like there would be required entries when the receipt is actually made, and users might lose track of the process. The discussion also overlooks taking advantage of early payment discounts on purchase invoices—the other side of the coin. All this makes me wonder whether the method outlined in the current Guide might not be more universally applicable and easier to understand. It works the same for sales and purchase invoices, allows for discounting tax or not, and doesn’t require activation of the Credit Notes or Debit Notes tabs (even if automatic). It also lets you specify any desired conditions on the early payment discount in a custom field and avoids having to further modify the software for early payment periods shorter than the nominal due date. Maybe this was a solution in search of a problem.